Current peer-reviewed journal software does not meet the needs of NGOs and institutions in developing countries. Olorien is a new software package to meet this need. Olorien provides an automated system for article submission, tracking, peer review, and publication. It publishes volumes online, and creates print-ready PDF files automatically. To meet the needs of NGOs and developing institutions, Olorien is free to use, and open source. The system supports publication in almost any known language, and is low cost to maintain. The architecture is built on open-source components, and incorporates modern web standards. Olorien is actively developed, and features continue to be added. The shift from paper to the screen Traditionally, scientific journals have been paper-based publications, released between quarterly and yearly. However, the advent of the Internet has made much more rapid dissemination possible. The Internet and the associated idea of Open Source have also brought about more open access to research for the general public. With this shift in how information is published and accessed, a variety of tools have been developed to allow institutions to leverage the Internet in their peer-reviewed journals. More than 15 applications for publishing are currently available. • Automated Submission: Allows users to submit articles that are formatted and prepared for the editorial staff without any work from the journal staff. • Automated Notification: Keeps all parties up to date on the progress of a submission, by email or other means. • Article Assignment and Tracking: Allows tracking of a submitted article, assignment to peers for review, and online review. • copyediting: Allows the editors to edit the article for better formatting without resubmission. • Automatic formatting and online publishing of reviewed articles: Articles are automatically formatted by the software to display correctly online, and can be published on an external web site without work. • Secure Access: Users must log into the site to access articles and reviews. Certain functionality is limited to the Editor-in-Chief. There is some debate on fee-based journals. Proponents point out that charging for access allows them to fund and maintain a high-quality body of work. Opponents argue that information should be free and open, and limiting research to a select few who can afford access increases the social divide between wealthy and poor. Free-information advocates also argue that fee-based publications limit cross-disciplinary advances, and ultimately, scientific progress. While both of these arguments have merit, well-derived technology has the potential to make the debate moot. If computer software can reduce the cost and labor of producing a high-quality journal, fees can be greatly reduced, or outright eliminated. Clearly this would be the best of both worlds. NGOs and Developing Institutions Existing software can work well for established institutions, but Non-Governmental Organizations (NGOs) and institutions in developing countries have an additional set of needs that are not currently addressed by existing applications. • Multilingual publishing: Journals should be able to be published in any known language. • Low or No Cost licensing: The software should be free, or have a low-cost option on its license. • Low cost maintenance: The software must be easy to use, and have low requirements for hardware and time needed. • Automatic creation of print-ready publications: The software should create print-ready files to reduce print preparation costs and time. These needs are not addressed by an existing software package. In many cases, organizations can get caught in a downward spiral - lack of financial resources keeps them from publishing, which limits their financial resources. The Olorien project aims to reverse that spiral. Olorien is a framework designed to meet the needs of NGOs and institutions in developing countries. It is a fully automated system for the creation of a peer-reviewed journal for both print and web. Olorien natively supports publication in any language, and it is completely free to use. Olorien was developed to provide a journal for Lyon Arboretum at the University of Hawai'i, and has been extended and opened for use by the general public. Olorien was created by the company Quantum Imagery, and is available for download at their site http://www.quantumimagery.com/olorien. It is an actively maintained and developed project, and will continue to add features in the years and months ahead. First and foremost, Olorien is a complete solution for management, peer review, and publication of a Journal. It supports all of the core features common to online peer review software, and also contains a few extra features of its own. Olorien follows a traditional cycle for peer-reviewed publications, but allows the software to replace some of the repetitive tasks. Figure 1 shows the flow from submission to publication. Olorien allows article submissions from anyone who has signed up for a free account. To submit an article, users go to "Submit an Article" page. On the submission page, they first type in their article title, abstract, and author attributions. Next, the user attaches the body text as either a plain text or HTML file. For convenience, Olorien can process the HTML generated by most popular word processors. Finally, the user attaches all of the images, figures, and tables used in the article. There is no limit to the number of full-color figures, diagrams, photographs, and tables allowed. Once submitted, Olorien automatically manages the typesetting and formatting. To begin, Olorien re-formats the submitted article to be consistent with the look and feel of the journal, inserts any attached figures or images, and translates any Olorien-specific markup used. From that "cleaned up" document, the application then creates a formatted HTML page for viewing online, and a print-ready PDF file for proofing. Both are immediately available for access by the author, and editor-in-chief. Once the typesetting is complete, an email is sent to the editor-in-chief notifying them of the new submission. All new submissions are immediately available to the editorial staff for assignment. Editors can easily assign article to qualified reviewers for review, comments, and recommendations. Olorien immediately emails the reviewer(s) that they have a new article for review, and the submitted article appears in the reviewer's Olorien inbox. The reviewer can then download the article in PDF format or view it online, then submit their review using the web site. Notification then is sent back to the editors and editor-in-chief that a review is in. 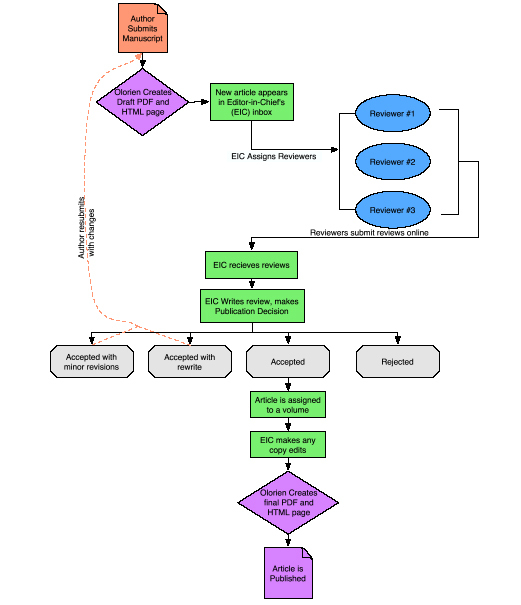 This process can be repeated with several reviewers, and can run in parallel, with several reviewers assigned to a given article simultaneously. Finally, once the editors have enough information to make a decision, the editor-in-chief submits the publication decision, and the author is notified. If the article is accepted, it is then assigned to a volume-in-progress in preparation for publication. In many cases, this generated PDF is immediately suitable for print. In other cases, editors may prefer to use the copyediting features to fine-tune placement of page breaks, etc. In these cases, Olorien allows the Editor-in-Chief (EIC) to edit the text of any submitted article, and to edit and re-upload any images or diagrams. Since much of the copyediting emphasis is on how the article will look in printed form, Olorien allows the Editor-in-Chief to "regenerate" the PDF for edited articles and volumes at any time. In traditional journal review processes, there is a clear delineation between authors, reviewers, and editors. In Olorien, we have used the same ideas in defining user classes. 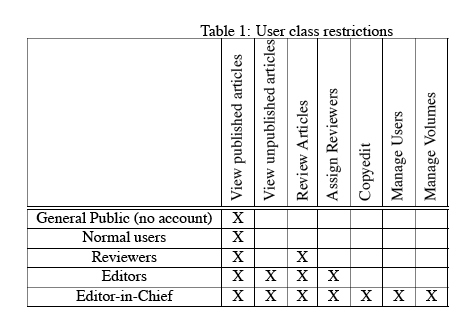 Olorien supports five "classes" of users: the general public, "normal" users (can submit manuscripts), reviewers, editors, and editors-in-chief. Figure 1 shows the abilities of each of these classes. The assignment of a user's class is controlled completely by the editor-in-chief, using an online interface. Each of these states changes the way the volume is displayed on the public site, and who can view the volume. The editor-in-chief can change the state of volumes at any point, and articles can be edited and revised for typographic errors throughout the process. However, once a volume is archived, neither it nor its constituent articles can be changed. Enhanced markup for web-specific features one advantage of an Internet-based journal is that it can take advantage of the unique capabilities offered by an HTML based system over its print counterparts. In Olorien, we have developed a simple markup set that authors can use to insert "tags" into their documents for advanced features like automatic cross-reference links, linked citation references and directly linked URLs for online sources. A complete list of Olorien tags is available in the online manual http://www.quantumimagery.com/olorien/manual. Authors simply have to type the tags into their documents before upload, and Olorien automatically processes and creates all the HTML and PDF code needed. Olorien also has a list of tags for standard document elements, such as section headers, subheadings and figures. Finally, for authors who choose to write their articles in plain text, as is recommended, there are also Olorien tags for most standard word-processor markup like bold and italics. To simplify deployment of a full journal-focused web site, Olorien also includes a simple mailing list manager. It allows members of the public to sign up for notifications of new volumes. Messages can be sent to the list by the editor-in-chief using a web-based interface. Notably, the email interface includes pre-made templates that include the table of contents for recently published issues, and direct links to the articles. This allows the Editor-in-chief to efficiently publish and promote a new volume. 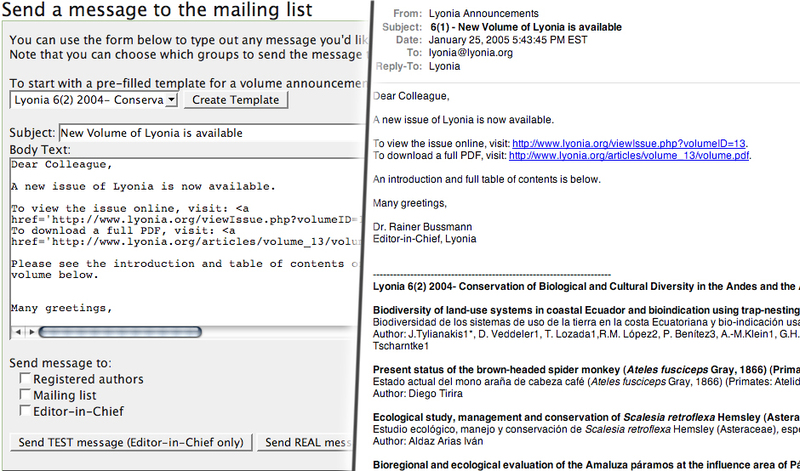 Figure 2 shows the email interface and the resulting email message. Figure 2: Screen shot of the email interface and resulting email message. Because most modern computer operating systems and word processors supportUTF-8, authors do not have to make any changes to their systems to take advantage of this functionality. A brief list of UTF-8 and Unicode-enabled products is below. Olorien also supports titles and abstracts in two languages for all articles. This allows organizations to publish the full article in its original language, and provide an abstract and title in a common language, such as English or Spanish. In future versions, Olorien will allow full versions of an article in an arbitrary number of languages. Olorien is completely free for use by the general public. There is no charge to download, install, or use the software in any environment. Since one of Olorien's key goals is to provide a no-cost solution for publishing academic research, there will never be a charge to use Olorien. Users are free to use Olorien for a journal that requires a subscription fee, but the software itself has no support for monetary-based access restrictions, and there are no plans to add that ability in the future. The computer to run the Olorien software and a constant Internet connection are one obvious institutional cost. Olorien has been built to run on a variety of operating systems, including Linux (free), FreeBSD (free), and Mac OS X (not free). One advantage to this approach is that new, high-speed hardware is not needed. The processor-intensive tasks of PDF and volume generation only happen once, then the results are saved onto the hard drive. As a result, a used, older computer running Linux makes a fine (and inexpensive) Olorien server. Software Support Since Olorien is open-source, it gains support from a community of users and developers as the project gains popularity. As more institutions deploy Olorien-based sites, similar snags in the setup and management process will be documented, as well as the solutions to those problems. The choice of open standards and common languages for the construction of Olorien also aids in software support costs. If an institution wishes to extend the Olorien architecture, they will have little trouble finding skilled programmers. Adapting existing practices Olorien has been designed to mimic a traditional peer review process as closely as possible. As a result, organization, which already has a peer-reviewed publication, should find the transition painless. Preparation for print for many publications, the typesetting, organization, and preparation of print-ready files is the most expensive and time-consuming part of the publication process. Olorien greatly reduces these costs by automatically preparing a PDF file that can be handed off to a press for printing without changes. changes publicly, for no cost. We have chosen the GPL as a license since innovation is likely to occur on Olorien outside the bounds of Quantum Imagery, and it is in the best interests of everyone in the scientific community if those changes are shared. This means that Olorien is "free" in both senses of the word. There is no cost to use the software, and its source code can be modified without restriction, as long as those changes are shared. In classic Internet terminology, Olorien is both "free like speech" and "free like beer." Olorien is built using a variety of widely available open-source technologies. It has been designed to be as portable as possible across platforms and systems, and all of the code used is platform independent. 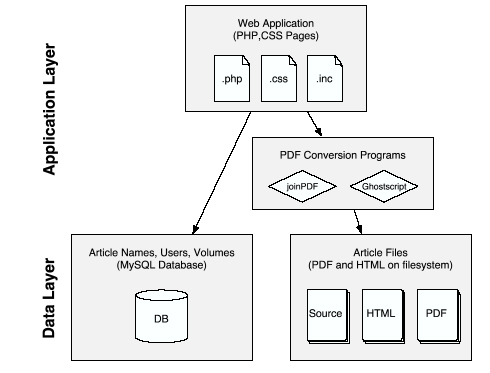 Olorien is made of three primary parts: the database, the web application, and the supporting article folders. The Olorien database contains all the content, review information, volume information, and user tables for a journal. It does not contain any of the content for the actual articles submitted, any attached images or figures, or the generated PDFs. The web application is a set of PHP pages that link to several external programs during PDF creation. The article folders house the original submissions from the author, as well as all generated HTML, PDF, and image files. This system is more efficient than keeping all of the information in a single database because it lets each parent system (the database and the file system) do the task it is good at. Databases were not designed to manage large, binary files like PDFs, and file systems were not designed for quick searching and retrieval of small bits of data. It is also useful to note that on operating systems where file access control is possible (Microsoft windows is the notable exception), access to the files is exclusively limited to the system user that runs the web server process. Since the data for Olorien is split into two areas (the file system and the database), it is important to make backups of both data stores. The Olorien package comes with a sample shell script that should work well for most backup needs. Interface Design Olorien is designed to be lightweight, accessible, and easy to use. Olorien uses Cascading Style Sheets (CSS http://www.css.org) for its visual formatting and layout, which allows users to quickly customize the look and feel of their own journal to match their institutional needs. Since CSS is designed to be backwards compatible, is completely accessible and usable in a text-only environment. Olorien requires all of the following packages to be installed on the server it runs on. - No packages currently available for windows. Note that several of the platform-specific "QuickPackages" available on Quantum Imagery already contain much of the above software pre-configured, and is a good solution for most use needs. Complete step-by-step setup instructions, QuickPackages, and user tutorials are available from The Olorien web site http://www.quantumimagery.com/olorien. Questions about setup and configuration can be sent to the author. Olorien is in active development, and has a set of features planned to address current shortcomings. Work is active on all of the following issues. • XML files, with a schema definition for Olorien. At the moment, Olorien is only supported on *nix-based operating systems, such as Mac OS X and Linux. While this reaches the majority of the computers that act as web servers, it may desirable to have support for other operating systems, such as Microsoft's Windows TM. There is no code in Olorien that prevents a quick and easy port to Windows, but at the moment, that effort has not yet been undertaken. It is hoped that the user community for Olorien will assist in porting the software to other platforms Interface localization Though Olorien supports localization of the entire site, the only language that is currently translated is English. As users set up Olorien-based sites in their own languages, we encourage them to send the translation files back so that pre-built packages for various languages can be provided. Multilingual support for full body text Currently, users can specify an abstract and title in two languages. However, this is not a complete solution for multilingual publication. To truly meet this need, Olorien will support an arbitrary number of languages for the title, abstract, and body text of an article. Editors will be able to choose which language or set of languages to publish for print, and all translations will be available online. For institutions that do not want to host their own copy of Olorien, a hosted version of Olorien will also be offered in the future. This will allow subscribers to host and manage their journal from a central server, without having to manage the hardware and Internet connection. However, given the costs of running a server, this service will probably not be free. While several software frameworks for journal management exist, none fully address the needs of NGOs and institutions in developing countries. For these groups, Olorien is an optimal solution. The management of journal creation from submission all the way through archiving allows these organizations to have a quality, peer-reviewed journal that might otherwise not be affordable. Low publication costs allow institutions to publish more research, allowing an increase in research funding, and turning the 'downward spiral' that can characterize low-budget organizations around. While obviously geared toward NGOs and developing institutions, Olorien is a complete solution for established research organizations looking to move to a more automated system with a web-based presence. It is feature complete, and undergoing active development for future improvements. Over the next year, Olorien will add support for Windows servers, more document upload formats, and interface localization. The community of organizations deploying Olorien will help accelerate this process.